Metal Meat Magazine, Contact us. 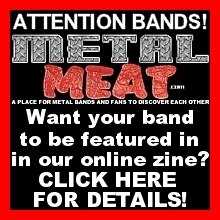 METAL MEAT is an online magazine featuring music, interviews, videos & articles with unsigned metal bands from all over the world. It is designed to promote and help unsigned and underground metal bands and metal fans discover each other.